I was sitting at my desk at work in Brighton, England, one day, and I thought, “I need an adventure!” Life was good, but there was something missing. I had been in a long-distance relationship with a Spaniard for 2.5 years and we had been flying back and forth between Madrid and the UK visiting each other so the obvious answer was for me to move to Madrid! So after some thought and discussion with my partner, it was decided that I would move there. I knew and loved the city and I had no binding ties to keep me rooted in the U.K as both of my children were grown and had moved away from home, so it all made sense. Time for an adventure! But what would I do for work while living there? A friend suggested that I would be a good teacher and that I should look into teaching English as a foreign language. I started doing some research and came across the website of TtMadrid. From the moment I made contact with them I was sure they were the right place as they were helpful and full of great suggestions and advice. I signed up for their 4 week intensive TEFL course. So the big day arrived and I landed at Madrid airport with just the contents of my wardrobe stuffed into several suitcases, including, for some reason, a dinner jacket! Looking back, I don’t know why I thought I would need that. Several days later, I was at TtMadrid to start my TEFL course. They tell you during your interview and on the website that the course is very intensive but, believe me; nothing can prepare you for quite how intensive it is. The staff and all my fellow students were fantastic, however, and just 4 ‘short’ weeks later I was a qualified TEFL teacher. The help from TtMadrid didn’t stop there. They sent out my CV to all of their contacts and soon the invitations for interviews started coming in. I took a position teaching with an Academy specialising in Business English and just 3 months later I got a full time position in the office of the Academy! So what is it like living and working in Madrid? I love it! Madrid is a fantastic city. It is much smaller than London, Paris or Berlin and so it feels like it’s a more manageable size. The people are warm and friendly, even if you only have minimal Spanish, like I do… And the food? Wow! 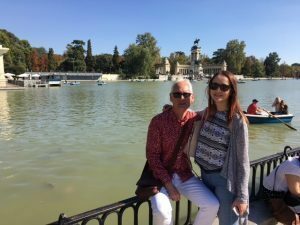 There are obvious differences and you sometimes get frustrated but you soon learn to adopt the Spanish “mañana” attitude to cope with those and they all add to the flavour of the experience. It is not difficult to be able to earn a decent income and the cost of living here is really affordable so you have money left over at the end of the month for extra trips and luxuries. Six months later, was it a good move? Yes, undoubtedly it was. Was going with TtMadrid a good idea? Certainly. Sitting at that desk in Brighton making the decision to move here seems a long time ago now but I am really happy that I did. I live in a place that I love; I have a job that I enjoy and a wonderful partner to share it all with. I have made friends along the way, who I know will be part of my life for a long time to come and I am enjoying every single moment of the adventure. Now all I have to do is focus on improving my Spanish but, perhaps ‘mañana’ on that. Let’s go for a Gin & Tonic instead in the street café just down the road and watch the world go by. 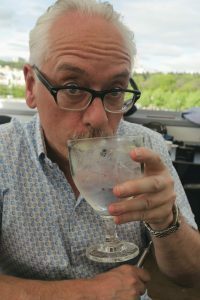 Did I tell you about the Gin & Tonics here – they are huge! And did I need the Dinner Jacket? No, but if ever you need to borrow one, you can contact me through TtMadrid.